This chapter looks at the tension between the assumed tendencies of journalism and the deep, inherited social and journalistic structures that anchor news coverage to a particular place, to an assumed audience and thus to specific affective dynamics and identities representation. 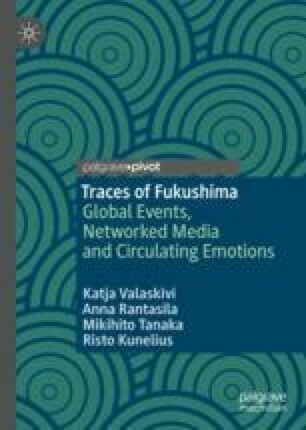 Empirically, this chapter focuses on four levels of mainstream newspaper coverage—the local, the regional, the national and the international—and tracks how the image and meanings related of the disaster was re-negotiated over time, during five years after the event. By applying a computer-assisted modelling and quantitative text analysis of the key vocabularies of journalism at different levels, it highlights the way that mainstream media function as differentiated affective platforms that emphasize alternative sensibilities. Song, Y., & Lee, C.-C. (2017). ‘Collective memories’ of global media events: Anniversary journalism of the Berlin Wall and Tiananmen crackdown in the Anglo-American elite press, 1990–2014. Journalism. https://doi.org/10.1177/1464884917720304.